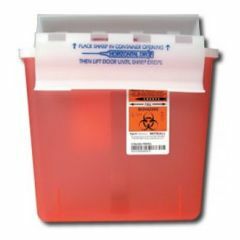 Allegro Medical offers a wide variety of Sharps disposable containers and needle disposal boxes at wholesale prices. Browse our inventory of product options including transportable containers, multipurpose containers, dual opening containers, collectors, phlebotomy containers, dialysis containers and more. AllegroMedical.com offers only the highest quality Sharps disposal products at the lowest prices guaranteed. See our Best Price Guarantee for more details. Sharps Safety Monoject Sharps Containers - 8 qt. Sharps Safety Monoject Sharps Containers - 14 qt. Red Sharps Disposal Container - 6.9 qt. Non-Stackable Sharps Disposal Container 1.7 qt. Non-Stackable Sharps Disposal Container - 23 qt.